The Odd Twins and Their Black Brothers! 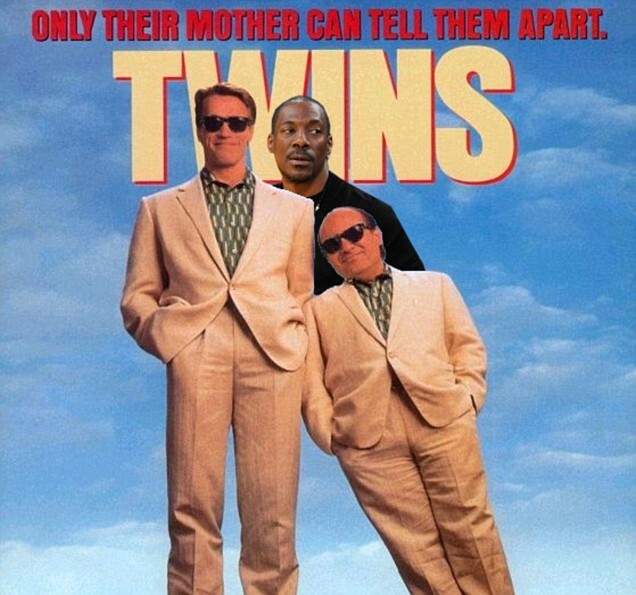 The last time we saw the odd twins together on screen was in 1988 when they first brought the hilarious twins to live, which successfully entertained their fans. And now ex governor Arnold Schwarzenegger and funny man Danny DeVito are reportedly set to re-team as they prepare to resurrect their characters for a sequel. The stars have reportedly started discussions to revisit the film, but with another surprise sibling thrown into the mix for the follow up, according to Heat Vision Blog. The Hollywood stars played long lost brothers who had been conceived by test tube, with Schwarzenegger getting all the good genes. Now they're back with Eddie Murphy rumored to be the favourite to take on the role of the third brother in the film, which still remains Arnold's highest grossing comedy movie.